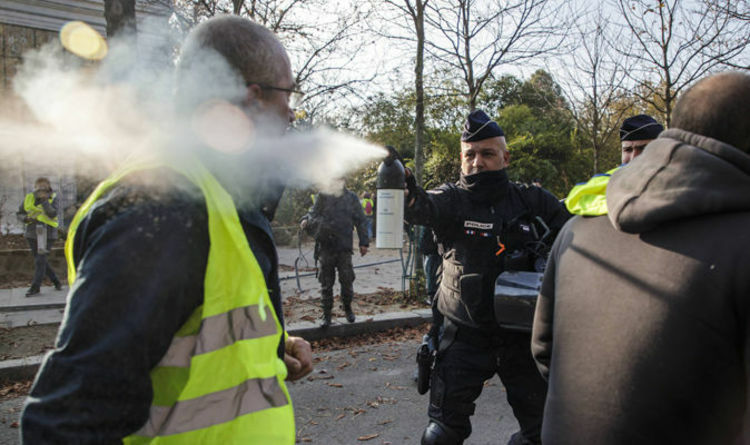 The demonstrators, part of a grassroots movement dubbed the "yellow vests", caused logjams on highways and blocked roundabouts as they railed against the fuel tax hikes introduced by Mr Macron, whose approval rating has plummeted according to recent opinion polls. The protests, which have been largely orchestrated on social media and which are aimed at preventing road access to some fuel depots and airports, have also drawn broader support from some voters dissatisfied with Mr Macron's economic reforms and his governing style. At a blockade on a road in the southeastern department of Savoie, a driver panicked when protesters surrounded her car and she accelerated, running over a woman demonstrator in her fifties, who died of her injuries, French Interior Minister Christophe Castaner said in televised comments. He added: "We're on maximum alert," insisting police would ensure no roads were completely blocked in order to ensure people's safety. The driver of the car has been arrested, he added. In total, 16 people were slightly injured in other accidents across the country, while another hit by a car in northern France was in a critical state, according to the interior ministry, which estimated some 50,000 demonstrators were participating in today’s protests. Some incidents occurred as a result of drivers not taking part trying to get around the blockades, police sources said. In Paris, a group of 50 protesters yelled "Macron resign!" on the Champs Elysee, although police stopped them from heading toward his official residence at the nearby Elysee Palace. About 50,000 people took part in more than 1,000 protests at roundabouts and motorway exits, Mr Castaner said. But the "yellow vest" movement has snowballed swiftly over the past month, catching Macron and even opposition parties off guard. It has already prompted a rare concession from the government, which announced last Wednesday fresh funds to help motorists on the lowest incomes. Mr Macron’s popularity has waned in recent months, with the most recent poll, published by Elabe after a survey of 1,002 people carried out between November 6 and 7, suggesting an approval rating of 27 percent. His image has been damaged by a string of resignations and a scandal involving one of his bodyguards, who was caught on camera beating May Day protesters.